As destinations go, few can touch the heights of delightful experiences that Dubai can. 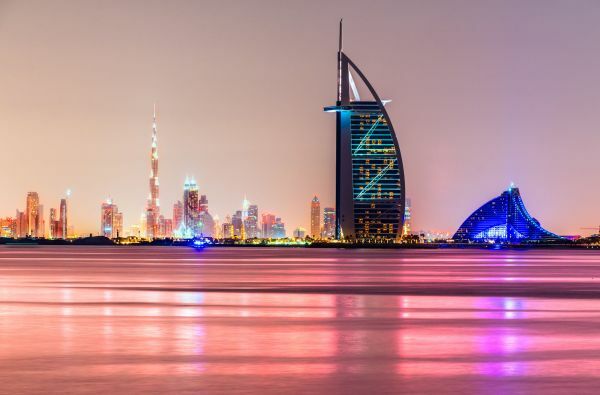 With its gleaming buildings that threaten to touch the sky to a range of sights and sounds that will enliven you, Dubai is the perfect place for musafirs of all ages to enjoy. Dubai represents the pinnacle of East-meets-West and this is something you will experience when you look up at its buildings. Stylish and modern, it has some of the highest buildings in the world and each one is a landmark that is globally acclaimed. Like the Burj Al Arab (Tower of the Arabs), whose distinctive sail shape is considered the international icon for Dubai. Or the Burj Khalifa, the world’s tallest tower that offers heart-stopping views from At The Top, the highest viewing platform in the world. Then there are the Dubai Fountains which, at 500 feet, are the tallest dancing fountains in the world! From the famous Dubai Marina to anywhere else in the city, the gleaming skyscrapers are proof of Dubai’s towering ambition to be a preferred destination for every kind of visitor. As the host of the world’s favourite shopping festival, you’d expect to find the best deals in Dubai. And you won’t be disappointed when you walk into shopping and lifestyle destinations like the Dubai Marina Mall, The Mall of the Emirates, and the Dubai mall, among several others. You can also escape the heat at Ski Dubai, the first indoor ski resort in the Middle East that lets you enjoy skiing, snowboarding, tobogganing, or just playing in the snow! Nature lovers will enjoy exploring the zoos and parks along with the Dubai Dolphinarium, the first fully air-conditioned indoor dolphinarium in the Middle East where you and your children can interact with dolphins and seals and gain a new insight into the environment. The original sounds of Dubai can be best experienced in its souks, the traditional outdoor markets that are an integral part of its cultural legacy and living proof of its importance as a trading centre since centuries. Souks are usually named after the products they specialise in, so whether you’re strolling about the Food Souk, the Perfume Souk, or the Spice Souk, you’re sure to be welcomed by the calls of traders inviting you into their shops to sample their wares. When you’re enjoying a cruise on the ocean, you’ll be calmed by the sound of the waves breaking against your dhow. And if you’re looking for some more exciting sounds, you can set your pulse racing to the sounds of the revving engines as you go dune bashing on your buggy. So book your tickets for the heights and sights of Dubai... there’s no better place to go ghoomne!